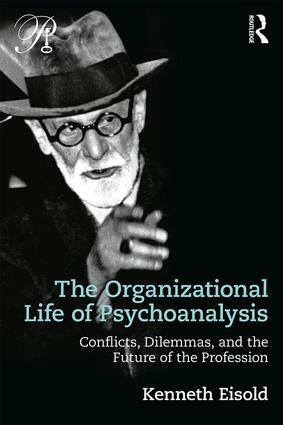 The Organizational Life of Psychoanalysis is a wide-ranging exploration and examination of the organizational conflicts and dilemmas that have troubled psychoanalysis since its inception. Kenneth Eisold provides a unique, detailed, and closely reasoned account of the systems needed to carry out the tasks of training, quality control, community building, and relationships with the larger professional community. He explores how the freedom to innovate and explore can be sustained in a context where the culture has insisted on certain standards being set and enforced, standards that have little to do with providing effective pathways to cure. • Who is to be in charge of training and who will determine those who succeed the existing leadership? • Which theories and practices are to be approved and which proscribed and censored? • How is the competition with alternative methods, including psychotherapy informed by psychoanalysis, to be managed? Several chapters are devoted to exploring the reciprocal influence of Freudian psychoanalysis and Jungian Analytical Psychology. Others explore the specific dilemmas and difficulties affecting the field currently, stemming from the massive restructuring of the health care industry and the changes affecting all professions, as they are reshaped into massive organizations no longer marked by personal relationships and individual control. The Organizational Life of Psychoanalysis will be essential reading for psychoanalysts, psychoanalytic psychotherapists, and anyone interested in the future of psychoanalysis as a profession. It will appeal greatly to anyone who has assumed full or partial responsibility for the management of a psychoanalytic institute or association. "This book needs to be read by psychoanalysts at every level of development, from candidates to institute administrators. Eisold brilliantly makes the case for the powerful presence of so many institutional and social formations in our every theoretical and clinical move. Psychoanalytic theory and practice is saturated with social process, institutional practices and ideologies. Much of the material in these chapters is painful and challenging to encounter. But Ken Eisold writes in a welcome and deft manner and the lessons he wants to teach us and that we must learn, arrive in a deeply accessible form. "-Adrienne Harris, New York University, Editor of The Relational Perspectives Book Series. "This book contains many brilliant insights into the origins and nature of the ills besetting contemporary psychoanalytic institutions. Ken Eisold has a unique and profound understanding of individual and collective psychology and of organisations. His work also offers helpful lessons from the past and the present which should not be ignored. "-Douglas Kirsner, PhD, Emeritus Professor, Deakin University; Honorary Member, American Psychoanalytic Association. Author Unfree Associations: Inside Psychoanalytic Institutes. "Kenneth Eisold has long been one of the most astute and insightful observers of the institutional problems of psychoanalysis. He is one of the few psychoanalysts who easily bridges the gap between a profound psychoanalytic knowledge of individuals, and that of groups. Eisold clearly illustrates our similar struggle to free ourselves from the confines of our founders, and to bring psychoanalysis into the modern age. "-Robert Pyles, former head of APsaA. Chapter 5. Psychoanalytic training: The "faculty system." Kenneth Eisold is a practicing psychoanalyst, as well as an organizational consultant, who has written extensively on the psychodynamics of large systems as well as on the organizational dimension of psychoanalysis and continues to advise and coach. He is Past President of the International Society for the Psychoanalytic Study of Organizations as well as former Director of the Organizational Program at The William Alanson White Institute, where he trained consultants in working psychodynamically with organizations. He is a Fellow of the A.K. Rice Institute.